Use of wastewater in agriculture in rural as well as peri-urban areas in India is not uncommon. Almost 90% of total water supplied for domestic use generates wastewater which could be diverted for agriculture purpose. Safe use of wastewater could be a potential source of water in agriculture especially for vegetable growers in peri-urban areas. These areas have large employment opportunity for female and male laborers to cultivate crops, vegetables, flowers, fodders that can be sold in nearby markets or for their livestock use. There are however number of limitations for wastewater treatment and reuse in agriculture such as mismatch between demand and water supply; salinity, treatment capacity and over nutrient application, etc. Moreover use of untreated wastewater in irrigation also may degrade groundwater system, accumulate salts in soils and create bad odour and further degrade other ecosystem services like downstream water quality etc. Decentralized Wastewater Treatment (DWT) system developed at ICRISAT Campus, Hyderabad is believed to address number of these problems and water scarcity issues at local scale. At ICRISAT campus, Hyderabad domestic wastewater is received from a community outside the campus. This wastewater is being diverted through a series of settling tanks to a small lake. These tanks and lake is a habitat to several migratory birds and generates number of ecosystem services (regulating and cultural services). In coming wastewater is polluting surface water bodies in ICRISAT. ICRISAT Water4crops team proposed to develop a DWT system to reduce pollutant load from this wastewater and reuse the treated wastewater for agriculture. The DWT system comprising a wastewater holding tank, constructed wetlands, and treated water storage tank is being constructed at ICRISAT (Figure 1). Similar DWT system is developed at University of Agricultural Sciences, Dharwad (UASD). At UASD, the source of domestic wastewater is effluent from campus residential area and hostels. The rationale behind developing DWT is – water scarcity, farmers and consumers getting adversely affected by direct use of wastewater in agriculture, environment pollution by disposal of untreated wastewater, and lack of sewage treatment plants in several localities. Wastewater treatment should be linked with integrated watershed development program at field and community scale (500-1000 ha). Implementing several agricultural water management interventions at one hand would enhance the water resources availability, and wastewater treatment on the other hand reduces total water demand (as the demand management approach). A multitude of resources and processes that are part of natural ecosystems can be strengthened by such initiatives. Coupling wastewater treatment along with IWRM (Integrated Water Resource Management) is not only helpful in enhancing crop production and income of small holder farmers but also in improving water quality of groundwater wells and downstream water bodies including better soil quality through C sequestration. ICRISAT is in the process of developing the ‘sites of learning’ in two model watersheds (Kolar and Bellary district of Karnataka) showing decentralized wastewater treatment and its use in agriculture. At Kolar, ICRISAT in collaboration with Coca-cola foundation and MYRADA are working with residents of these villages to agricultural productivity and livelihood through integrated watershed management program. Though this region often faces acute water scarcity, it is well recognized for tomato cultivation. High irrigation demand for is driving groundwater depletion. Muduvatti village is one of the nine villages from micro-watershed where DWT system will be constructed. This village has a masonry drainage canal of about 2000 m, which collects domestic wastewater from about 400 households and the rainwater. Another 500 m length of drain is proposed to be constructed. We identified two farmers who are using untreated wastewater for irrigation. They have constructed water collection pond to collect wastewater. Collected wastewater is being reused for the cultivation of vegetables. One farmer Mr. Govindappa has adopted drip irrigation with 3 hp diesel engine pump and cultivated vegetables (bitter gourd, ridge gourd and tomato in one acre of land during the post-rainy season. Another farmer Mr. Nagaraj has also constructed a pond (15x20x2 m) and uses sewage water by flood and ridge and furrow method to irrigate one acre of land grown with brinjal, ridge gourd and tomato. 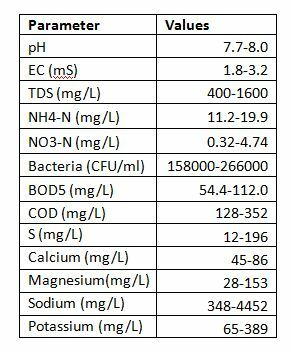 We have collected wastewater samples from these water collection ponds and analyzed for various parameters (Table 1). These wastewaters have high concentration of bacteria, which is very unhygienic and could cause several skin diseases to farmers and other health related problems to consumers. We propose to convert present water collection pond into decentralized wastewater treatment system consisting a constructed wetland in one of two farmers’ field. Simple schematic of constructed wetland is shown in Figure 3. Table 1: Characteristics of wastewater collected from Muduvatti village. We also want decentralised waste water treatment plant to be installed in our village in Punjab . Our village pond is getting bigger day by day and groundwater level falls on other hand . We also have to use costly chemical to enhance vegetables production . Kindly reply , as this treatment plant is best suited for our village , as per its details .